It’s made me stop every time I walked passed, which may be considered a good thing in the world of branding and advertising, but this advert has actually lost its charm for me. I can’t decide if it is the strange nose like bit on the top of the ad or the background looking far too much like flattened skin with a ribbon and items spread across it. It’s just not working for me! It clearly can’t be skin because it would seem very peculiar to spread a number of bracelets across someone’s tummy and still have that much space left in-between without showing any limbs. 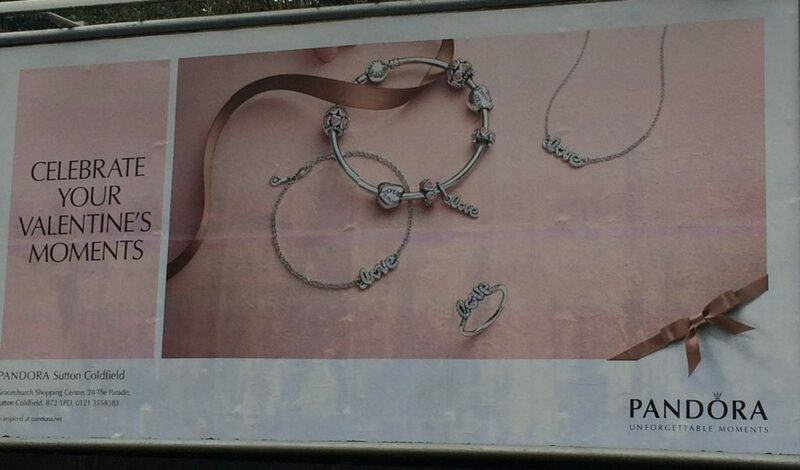 Oh well, Valentine’s is over so hopefully there will be another less curious advert appearing there instead. Is it skin? Does it have a nose? Whatever it is, it’s not making me want to get near it!